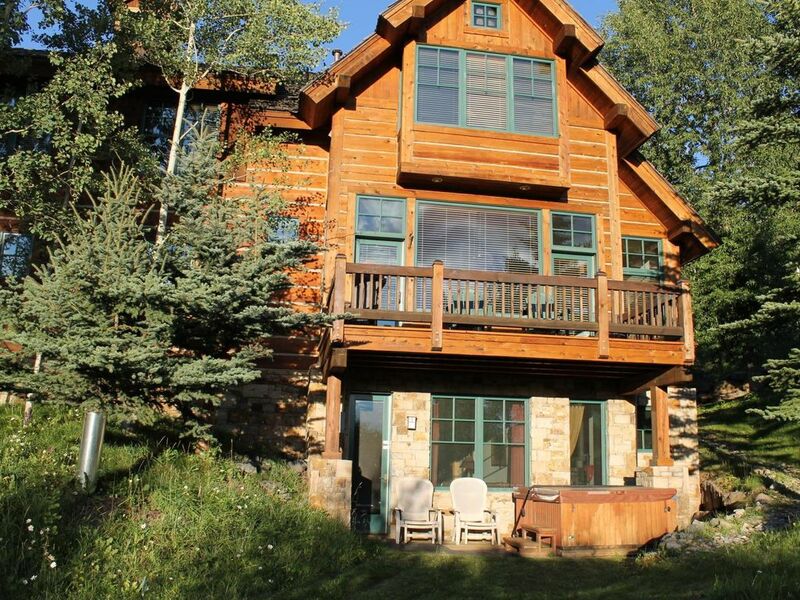 Award Winning Luxury Log Home: Ski in, Hot Tub, Views! Book New Year week Now! Designed by an award-winning architectural team, this home is located in a very private and quite setting. It is a perfect spot to reconnect with your loved ones. The layout is particularly well suited for couples or families with children. The kids enjoy the downstairs family room while adults can mingle on the main floor great room allowing everyone privacy. Located in a private cul-de-sac yet it is only minutes away from all winter activities. This very special home has great expanses of natural heartland pine, large log posts and beams, granite and tumbled marble countertops, ten-foot ceilings and a gourmet custom kitchen furnished with everything needed to host a family feast. This home is appointed with exquisite furnishings many of which have been custom made and all of which add to the great ambiance and character of this log home. The great room and kitchen area are the perfect gathering areas to reconnect with close friends and family. There are multiple flat screen TV’s throughout the home, cable and high-speed internet. Overlooking the tenth fairway of the Telluride Championship golf course the home has spectacular views from every window. The main deck at the end of the great room is perfect to sip a glass of fine wine and either watch spectacular sunsets after a day on the slopes or private jets landing and departing from the Telluride airport. . The main master bedroom with king bed, is spaciously situated on its own level. After a hard day skiing, climb into the Jacuzzi tub or steam shower for two. The second master bedroom on the lower walkout level also has a king bed, bath and direct access to the outdoor hot tub. This is a terrific spot to relax in privacy and experience world class star gazing. A truly great setting for a romantic evening! The 3rd bedroom has a queen bed and private bath. It is on its own level offering everyone in your party private space. For additional guests or children, the lower level family room has a large sectional that makes into a queen bed. The greatest amenity, however, is the FREE limo service that operates door to door anywhere in Mountain Village. No parking issues, no standing and waiting at shuttle stops in a snowstorm. Best of all, this is the perfect transportation for families with kids. Beautiful property, great morning views. Stayed here with our ski group of 6 and it fit everyone really well. Rino was a great host, looking forward to coming back soon. The house is lovely and I was amazed at the beauty of Telluride. The Gondola was an amazing way to see the area and enjoy our stay. Thank you Reno, it was perfect! My husband and both sets of parents had a lovely early September stay in this comfortable, nicely furnished mountain home. There was plenty of room for all of us and we had everything we needed. Rino was very friendly and easy to work with. We can’t wait to plan a return visit! Very nice home. Open concept kitchen, living and dining room. Easy access to all amenities. Close to town and convenient dial a ride to gondola makes it easy to get around. My group had an amazing time staying here during a recent trip to Telluride. It is in a great location surrounded by beautiful views, and the free dial-a-ride service was an excellent feature to help us get into town (via the gondola) anytime we needed. The house was clean and had plenty of room and amenities for our group, would highly recommend!